Your car's performance exhaust system needs to be working correctly to keep your car in top operating condition. Performance exhaust systems, whether they are aftermarket exhaust systems, custom exhaust systems or stock systems, help your vehicle in a variety of different ways. The exhaust system creates a more enjoyable driving experience by quieting the engine noise. It also reduces air pollution by controlling the emissions your vehicle releases. Having a properly operating catalytic converter is crucial to ensure that the exhaust system does not have leaks. Visit your local Meineke #787 in Phillipsburg, NJ, today for more information about maintaining high-performance exhaust systems. 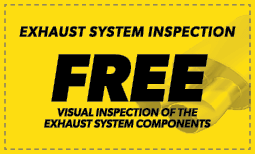 A question we are frequently asked at Meineke #787 in Phillipsburg, NJ, is: "When do custom exhaust systems need inspections?" If you're already asking this question, you probably need one. You might be noticing odd symptoms such as louder volume, stronger fumes, or a new vibration. These are all signs of leaks and failing catalytic converters. Even if you're not noticing any of these symptoms, your car's performance exhaust system should be inspected if it's over 8 years old. Ensure that your car is in the greatest shape it can be in. Investing in muffler repairs will increase your car's longevity before the problems get any worse. A common question we receive at Meineke #787 in Phillipsburg, NJ, is whether fuel efficiency is really affected by the exhaust system. The answer is yes. Your exhaust system should include an oxygen sensor. This sensor is designed to detect the amount of oxygen that is coming through the entire exhaust system. It sends a signal to your engine to either increase or decrease the amount of fuel it burns to maintain maximum efficiency. However, if the oxygen sensor is defective, it can cause your vehicle to expend unnecessary fuel. Having your oxygen sensor changed every 60,000 miles can help eliminate this issue before it begins. Are you thinking of investing in a performance exhaust system, but you want to have more information first? There are several benefits to getting aftermarket exhaust installed on your car, including a more powerful engine. Performance exhaust systems for cars allow exhaust gases to flow more quickly and easily. Your engine can breathe more and perform better with the help of high performance exhaust. Another thing that many drivers enjoy about custom exhaust systems is the louder and more aggressive sound produced. If you want to learn more about installing a new exhaust system on your car, contact Meineke #787 in Phillipsburg, NJ. Where can I go for a new performance exhaust system? If you want the best performance exhaust system possible for your vehicle, don’t look any further than Meineke #787. We carry many kinds of performance exhaust systems for cars, no matter what their make or model is. Our technicians are committed to providing you with the most expeditious and affordable aftermarket exhaust services possible. Whether you are upgrading to a high performance exhaust or getting some muffler repairs done, we’ll do everything possible to keep your muffler repair cost low. Stop by one of our many convenient locations in Phillipsburg, NJ.